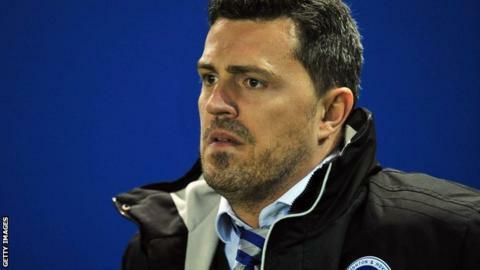 Head coach Oscar Garcia says Brighton have "nothing to lose" from their as they bid to make the Championship play-offs. Reading sit sixth, a point ahead of Albion, with the same goal difference. The final Championship play-off slot is the only promotion issue still to be settled in the regular Football League season. The League Two title remains up for grabs, but the top three have already secured automatic promotion. The Royals, relegated from the Premier League last season, host Championship runners-up Burnley on Saturday. "The pressure's all on Reading not just because we're below them, but because after being in the Premier League they should make the top six," said Garcia. Nigel Adkins' men suffered relegation to the second tier alongside QPR and Wigan in 2013, both of whom have already sealed a top-six finish. and he has led Brighton to the cusp of play-off qualification after a slow start to the campaign. He won just two of his first 12 league matches in charge, as well as losing in the League Cup first round against Newport. "I'm proud of the season the players are having, they deserve this chance," 41-year-old Garcia told BBC Sussex. "We'll need to be at our best to beat Nottingham Forest. It's a good game to be part of, and to enjoy, because there's nothing to lose for us."